Google “How to Find Blog Niche” and you will see thousands of articles that can help you decide on blog niche. Each of those articles is different than my step by step process of selecting a perfect niche for your blog. So before we begin my process of finding the niche for a blog let us understand niche. Niche (pronounced as NICH) means a position or place a person or thing is comfortable. (Refer reference.com for complete definition). So if you are trying to find a niche for your blog, you are trying to find an area to blog where you are comfortable. The mistake that many understand about blogging niche means the category of blog but that is not completely right. Every blog niche is a category of blog but every category may not be niche for blog. You may be comfortable blogging about one topic over other and so a niche means the comfortableness of the blogger on the topic. As a blogger, you cannot blog about anything and everything under the sun and you have to select topics that you may be able to help others and in the process learn more about the topic. On top of that if you have too broader topics, you may end up having readers that are too diversified and so you may not be able to focus equally on each of those topics and justify it. Let us take an example to understand the broadness of topics. A blog can be about operating systems and you are comfortable blogging about each of the operating system Windows, Linux, Mac, iOS, Android. If you are blogging about operating systems and if you publish an article about Windows, it may not interest the readers who are a fan of MAC and vice versa. So a blog about operating system may not be a good niche and it may become tough for you to make all your readers happy. When starting to blog, we tend to keep things more broad than narrow because broader blog niche means topics are very easy to find. You can easily find 10 to 15 topics to blog about in operating system niche than may be a Windows niche blog or Mac niche blog. You may think that Mac and Windows at topic is something very broad and can have such issues but you will find such issue in every topic. Health and fitness blog can have issues on articles related to use of supplements. A client of mine had issues in his blog where he was against use of extreme supplements but his articles on mild supplements had many more comments and arguments that he did not liked. Finance blog can have issues with type of investment. My investment analysis blog is focused on investing in markets in India but I have many articles that are related to investments in properties and home loans. 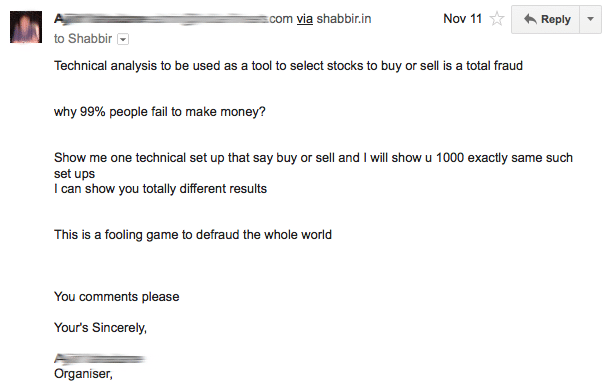 Readers who prefer my non market related investments may not always prefer reading my articles that are purely related to investing in market and I often get emails like these. Keeping the blog niche broad is a mistake most new bloggers tend to make because it is quite normal to be doing so as well because it is more easy to find blog topics when you have a broader niche but then it becomes more difficult to be finding the right kind of readers despite good quality content. So it is very important for a blog to have the right niche such that each reader that lands to any article on the blog is interested in every other article on your blog or at least most of the article on your blog. Back to original question: How to Find the Right Niche? We know what is niche and why it is very important to select the right niche for your blog and so now let me address the original question of the article which is how I find the right niche for a blog. My way to find a niche is completely different from what other do and so it is important to understand how you should be approaching the process of finding the niche you want to be blogging about. Normally people start by following a blogger and try to blog about the same niche which the other blogger is blogging about but if you don’t have a keen interest in the niche you want to blog about, you will not be able to generate lot of useful content and so ultimately you will not be able to get the blog of the ground. My MBA Forum is a classic example of it. I never had any interest in MBA but started the forum because one of my friend was ready to write content for me. Once he moved on with some other options, it was quite difficult for me to get quality content. I still hired few writers and purchased lot of good quality content but then suddenly it all stopped because the site never got the kind of attention it needed. Now the site is as it is with content that was purchased. Not closing the site down because it has some good project reports for MBA Students. So if you are not interested in a niche, you seldom succeed as a blogger. I have seen so many bloggers who try to copy other bloggers and fail miserably. So before you begin blogging about something take a piece of paper and pen and write down all your hobbies. At least make a list of 3-5 hobbies and don’t worry it can be anything like cricket, bikes, gyms, reading books or even playing online games. Just make sure you are honest to yourself when making your list of hobbies. Oh come on… Being honest? Even when you are all alone and writing your hobbies, you can be influenced by lot of things. You may not have listed your hobbies that you want to be doing but may be because you want to be showing off to your friends. So for example you may have written traveling as one of your hobbies because you think you love traveling but the reality could be you want to be showing your friends that you love traveling. Gadgets becomes everyone’s hobby these days but are you a gadget freak or you just want to be using them. Are you a biker because you love bikes or because you just want to show off with your friends your bikes. Are you a body builder because you love to be fit or you are a body builder because you want to be showing off. So once you have your list of hobbies, just put a number beside them about how many books you have purchased for your hobbies. If you have not purchased any books to pursue you hobby, they are not your hobbies and you just want to be what your friends wants to see in you. So once you have your honest list of hobbies sort the hobbies in decreasing order of your liking and the niche of your blog is the one right at the top of your list. There is a school of thought that you should choose a niche which is popular but I don’t think that way. Lets say you are very interested in a niche that is not very popular like a research topic in radio physics. Many bloggers suggest you should see if there are enough readers who want to be reading what you will be writing on but I don’t think there is anything on internet that people don’t read these days. Yes I agree that you may not be able to build a highly readable blog but then you may be having a very small community in your blog that is very dedicated to know what you share. The bottom line is if you choose a topic that interest you, you may end up writing from a very unique view point that can make your blog popular faster than choosing a topic that does not interest you or is secondary in your list of hobbies. What if Niche is Very Competitive? My view is it does not matter. Both my blogs are in super competitive niche and I don’t think it matters as long as I have my own voice. I can write about finance and investment because I do lot of research and experiments for my own investments in market and so can never run out of topic for writing about investing in market and same applies to IMTips.co. Darren Rowse of Problogger focuses on niche of making money from blog and does not blog about everything under the topic of blogging. Pat Flynn of SmartPassiveIncome focuses about generating passive income from blogs and niche sites. Niche within the make money online niche or blogging niche. Brian Clark of CopyBlogger blogs about writing authority content for blogs and content marketing. What if you cannot find a niche within a niche? Focus on targeting people from specific geography. I focus on Internet marketing niche and that is quite vast as well as very competitive but then I focus on helping Indian bloggers and entrepreneurs simplify Internet marketing. I blog about Internet marketing from an Indian perspective that helps me have my own voice in a very crowded space. I am sure you have a right niche for your blog by now. Next is to find 10 topics that you will search in Google for more information about your hobby or your niche. 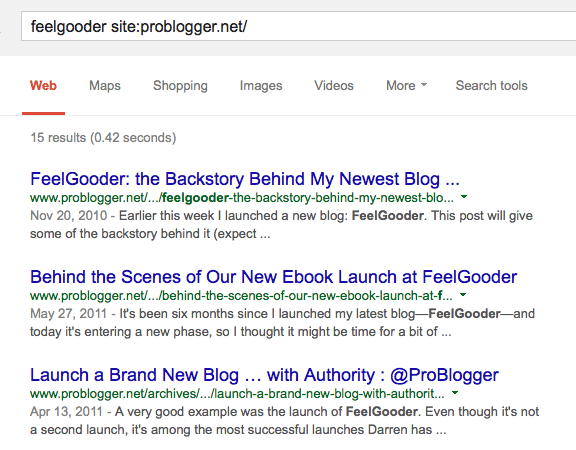 Those ten search terms becomes your first ten posts for the blog.